Just in case you don't feel like shelling out $300 for the Motorola DROID and then waiting a few weeks for your $100 debit card, Sears is giving buyers of the first Android 2.0 phone an instant discount. The retailer is taking $100 off the top, plus an additional $50 off for new Verizon customers signing a 2 year contract. That works out to a price of $149.99, just like it says on the ad. Sears might not come to mind right away as a place to pick up the hottest handset on the planet, but at this price, it might be the place you wallet will take you to buy the device. @cj Why so proper why such aggression you didn't/couldn't/can't get any of the droids correct? Nothing like checking out phonearena and getting a little english 101 in. First, Great response to #1. Thank you. Second, Sears actually started selling mobile phones about 1989. I bought my first one from them at a store in Kansas City sometime in late '89. It was a Motorola Bag phone - big sucker with a battery that was bigger than any 3 phones out on the market today. @ sinfulta, I just wanted to say that you are still wrong. You are right in selective cases, but not here. I also wanted to say @ cj, that was funny. No offense vzwman, but "boom roasted!!!" So they are trying to be the price leader in the Droid oligopoly? Way to fail droi'e'd man. Please stop posting your copy and paste ads! Its by Motorola. Wait a week and they'll pay you $50 to take it off their hands. I bought the droid for 254(taxes included CA) out the door and after seeing this I went back to bestbuy and they did a price adjustment thanks to sears and phonearena. Yo fair&balanced, quit being a fag, the droid is awesome...superior to any phone out there right now. You keep trying, little girl. Keep trying. keep trying? No need to try...what's done is done! quit being a fag and accept that Motorola is back. I bet you'll end up with a Droid. hahaha...wasted a large amount of money, please!! this great phone was only$ 204 (taxes included)...how is that expensive? Perhaps for you. It's not anger, it's just that I find extremely stupid that you speak bad about this phone when you don't own it. You know nothing about it. Just because Motorola is the manufacturer does not make it a crummy unit. Motorola has the right to come back from the dead just as any other manufacturer does and they did a great job with this phone. No one is laughing...the phone has great reviews. CNET has it tied with the 3GS at 4 stars, total overall rating of 8.3. Phonearena has it at 8.5 with a user rating of 9.2. You are just a fool spitting nonsense because you find this phone expensive and more than likely cannot afford to join VZW, and if you already are a VZW customer, you will get this phone sooner or later. i agree with you 521...as for fair & balanced....you sir are no fox news. 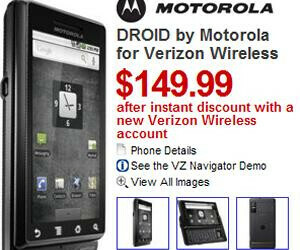 hey i want to buy a droid now but idk how to buy it online with debit card.